This is a dish for when you can't make hard choices and refuse to accept that there can be too much of a good thing. As far as we know there's no real classic Italian sauce combining chilies AND bacon AND roasted mushrooms, but these are three of our favorites and if we're going to take the time to make a sauce that requires slowly crisping bacon and gently simmering whole tomatoes until they release all their sugars we want it all, damn it. 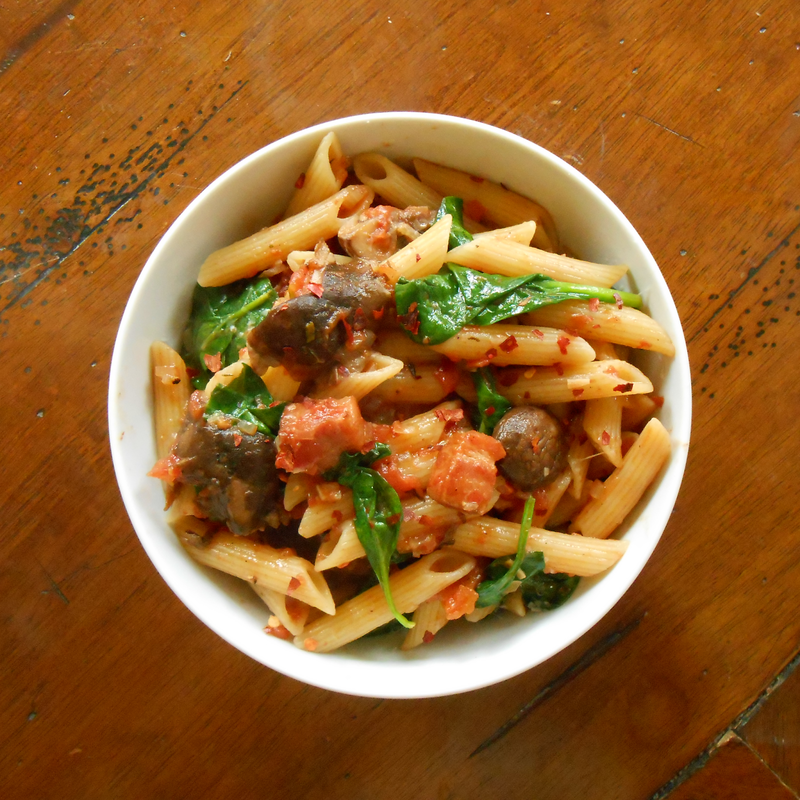 One bite of chewy penne coated in meaty-smoky-spicy indulgence and any feelings of shame will be overwhelmed by pure sybaritic bliss. Plus, there's spinach in it, so it's healthy! 1. Sauté bacon in a heavy-bottomed skillet over medium heat until rendered and crispy, about 7 minutes, stirring occasionally. If it seems like it's off to a slow start, try covering the skillet for a minute or two to coax out some of the liquid. Remove bacon from skillet with a slotted spoon and drain on paper towels. Pour off fat. 2. Add butter, onion, red pepper flakes, and 1/2 teaspoon salt. Sauté over medium heat until onions are translucent, about 3 minutes. 3. Add tomatoes, splashing a little water around the sides of the can to get out the last drops of their liquid. Add pepper, bacon, and 1/2 teaspoon salt. Lower heat to medium-low and simmer gently, stirring occasionally, until tomatoes are soft and sweet, around 35 minutes. Break up tomatoes with a fork or the back of a wooden spoon every few minutes as they cook. 4. While the sauce cooks, heat 1 tablespoon canola oil over medium-high heat in the other skillet. Add half the mushrooms, 1/4 teaspoon salt, and 1/4 teaspoon black pepper and sauté until well-browned, about 4 minutes. Add to sauce and repeat with remaining mushrooms. 5. When the sauce has been simmering for 15 minutes, bring 6 quarts of water to a boil with 2 tablespoons salt. Add penne and cook until 1 minute shy of package directions, about 8 minutes. Reserve 1/2 cup pasta water and drain. 6. Return pasta to the stove over medium-low heat. Add sauce and reserved pasta water. Simmer until pasta is nicely al dente (slightly chewy) and has absorbed some of the sauce, about 2 minutes. 7. Taste and correct seasoning--you may need to add a little more salt. Turn off heat and stir in spinach and Parmigiano-Reggiano. Serve immediately, garnished with more Parmigiano-Reggiano.